It’s all about the books. Friends, family, school, “real jobs”, they were just obstacles to be tackled so that I could return to my true love: books. All I have ever wanted in this world is to read and write books. My criteria for choosing a purse is that it must be able to fit a paperback book inside. I took books on my honeymoon, and bought more while we were there. I picked my major because it looked like I would get to read a lot of books, and also I thought it would provide me with interesting background information for my own books (which it did). From the time I was twelve on up, I told people that I wanted to be a writer. When they said, “So, you’ll teach and then maybe try to write a book?” I would just shake my head. No, I was a writer, and that was all I wanted to do. So over the years until I got published, I lived in Idaho, in New Jersey and Delaware, and in Utah, because it didn’t matter. I could read and write anywhere. I’ve worked at a wedding invitation factory (Bet you didn’t know they made them in big scary factories, did you? ), at a video store (back at the birth of DVD), at libraries and bookstores, and even been an office lady at a school while I waited to get published. I knew that I would be published eventually, because . . . well, I just had to be. Now, don’t get me wrong, I have other interests. I took eight years of German, four of Norwegian, and even studied Old Norse so that I could read the great Viking sagas in the original language. I knit like a maniac: hats, scarves, sweaters, dog sweaters, socks, felted purses, you name it. I play the piano and viola, love to travel and to watch movies. But mostly, it’s about the books. She has written and published eleven books in three different series, plus a stand alone novel. My favorite series of hers is probably the Dragon Slippers series, but I also love her fairy tale retellings, though those are geared at a bit of a higher age level than her other series. Her third series is about a girl who lives in a castle that’s sorta alive… or, anyways, it changes a lot and it sometimes complies to the wishes of the main character. As you can tell, Mrs. George is a very creative and inspired author, and I hope you have the pleasure of enjoying her books! For Claire Boucher, life is all about skating on the frozen cow pond and in the annual Maple Show right before the big pancake breakfast on her family’s maple farm. But all that changes when Claire is offered a once-in-a-lifetime opportunity — a scholarship to train with the elite skaters in Lake Placid. Tossed into a world of mean girls on ice, where competition is everything, Claire soon realizes that her sweet dream come true has sharper edges than she could have imagined. Can she stand up to the people who want her to fail and find the courage to decide which dream she wants to follow? I’ve read this book so many times since I first picked it up years ago, because it’s just so cute, inspiring, and relatable. 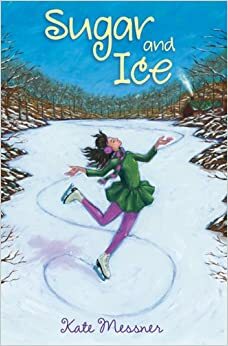 Claire wants to do what she loves, which is ice skating, but to get there she has to push through all the pettiness and competition of teenage girls. Claire is great, loves her family, and is a loyal friend, and her best friend who loves to read paranormal YA books is pretty funny too. Oh- and just to put it out there, don’t worry if you know nothing about skating, because I love it, and I can basically guarantee that I know even less than you. Ever since her father died, kooky Gilda Joyce has been working hard to sharpen her psychic skills. She’s determined to communicate with spirits from the Other Side and become a crack investigator of spooky, twisted mysteries. After wrangling an invitation to visit San Francisco relatives, Gilda discovers just how much her dreary, tight-lipped uncle and his strange, delicate daughter need her help to uncover the terrible family secret that has a tortured ghost stalking their home. From poignant to hair-raising and hilarious, this is a behind-the-scenes, tell-all account of the very first case in the illustrious career of Gilda Joyce, Psychic Investigator. I think there’s five of these books…. Anyways, this is the first one. Gilda is a self-proclaimed “psychic investigator,” who took that title unto herself when her father died. Now, she tries tons of crazy methods to get spirits to talk to her. They sorta do at first, too… except they sorta don’t. That makes sense, right? Anyways Gilda Joyce is an awesome character. Gilda’s psychic signal: An itch in her left ear. Gilda’s automatic writing method: Typing on her father’s typewriter. Gilda’s pendulum: an enormous Everlasting Gobstopper affixed to a lengthy piece of pink yarn. I know I haven’t said much about the book itself, but to be fair, it is a mystery. Have a great week! Fantastic Beasts follows Newt, a well-meaning British magizoologist who brings his case of magical creatures to New York. After he bumps into Jacob, a No-Maj (the American word for “muggle”), Newt accidentally lets some of his animals escape. These fantastic animals, including the Thunderbird, “a creature like a large albatross, its glorious wings shimmering with cloud- and sun-like patterns,” are the best part of the story. As Jacob says in the screenplay and in the movie which barely changes a thing from its source material, “I ain’t got the brains to make this up.” Only Rowling does. ALL OF THE CREATURES NAMES. 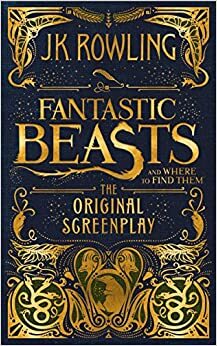 Not that I don’t hang on to every word said by Eddie Redmayne/Newt Scamander, but he sure does have a loooot of creatures in that case, and having the book tell you what they are called and what they look like every time has been great. INSIGHT INTO WHAT THE CHARACTERS ARE THINKING. Okay, so, in theory actors/actresses do this, and the people acting in Fantastic Beasts did a pretty good job with it, revealing a lot, but there’s some things you just can’t know about a character until you can read their voice on a page, so I really feel like I understand the characters better now. THE ILLUSTRATIONS. Guys. Besides the fact that the cover is completely gorgeous between the lettering and the coloring and the layout etc., there are drawings of all the creatures in between each… um… chapter? Anyways, it’s really really really pretty and actually maybe my favorite thing about the book at the moment because PICTURES. IT’S SHORT. It wasn’t meant to be a book, it was meant to be a screenplay, and “Newt does crazy mating dance with magical rhino” (sorry for spoilers if you haven’t seen the movie yet) takes up a lot less room/time to write down/read then it actually did in the movie. So yeah, it’s a quick read. NO EDDIE REDMAYNE. This one’s self explanatory, right? I had never heard of Eddie Redmayne before Fantastic Beasts, and now I have plans to send him piles upon piles of fanmail until he responds. And in the screenplay, well, you always have your imagination I suppose, but no Eddie. Okay, so this is a website dedicated to Shannon Messenger. What I’m going to say here, is why. The characters. This is probably my favorite thing about Keeper of the Lost Cities. I care about what happens to Sophie, Fitz, Keefe, Dex, Biana, Tam, Linh, etc. so much that it’s a little bit scary sometimes. Because Shannon Messenger just wrote them into existence and with a single sentence, she could kill them. She has all the power here. And what she’s done with that power so far is make me relate to all the characters, even some of the ones I don’t want to, because as this series has progressed, we’ve seen the good and the bad in every character. Lodestar, trying to have no spoilers here, but Lodestar introduces a new character, though not really new, and I’m super excited to find out what’s going to happen with her/him/it, because they have a lot of potential. The world. Sophie’s world is certainly different form ours, which is interesting because we (as humans) live so nearby to the other intelligent species, but are so far apart in so many non-literal ways. One really interesting thing about the Lost Cities is that they’re supposed to be perfect. Their world is supposed to be the perfect community, and yet it’s hopelessly broken. I think one of the major factors in this is that they can’t allow themselves to feel guilt, or they risk their minds breaking. So if something happens they feel bad about, they just erase the memory; pretend it never happened. How can a society truly function like that for long? The plot. Obviously, even with great characters, a book would be nothing without a story. One of my favorite parts about reading Shannon Messenger’s books is that she always surprises you. The story might have started out simple, but with every book it grows, and every page brings something unexpected– which sometimes you’re glad it happened, and sometimes not so much. But it keeps you turning the pages. 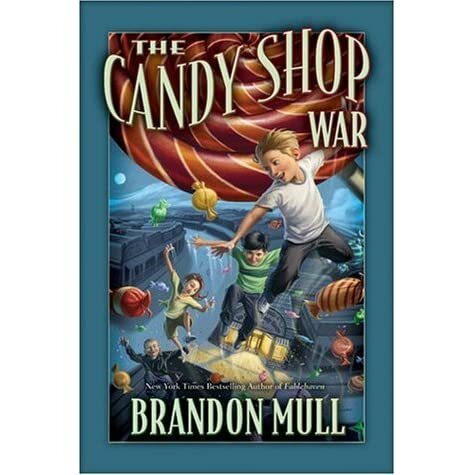 The Candy Shop War (2007) is a children’s fantasy novel by Brandon Mull about Nate, and his friends, tomboyish Summer, cool Trevor, and smart Paul (who everyone calls Pigeon, due to an incident in third grade), are given magic candy by Belinda White, the owner of a new candy and ice cream shop, but the fun turns sour when she uses their trust to do terrible things, and they have to go to John Dart, an agent that works against bad magicians, and Sebastian, another candy shop owner, but a good magician, unlike Mrs. White. I first read The Candy Shop War a long time ago, and it’s been well read ever since– in fact, the front cover of it fell off. None of the pages though, and that’s all that matters. This book makes you feel like a kid, excited about all the special candy and its powers. It makes you want to run to a candy shop right away, and buy the lot of it. At first, anyways. I don’t think I read the plot description of this book before I first read it, because I remember the whole Mrs. White thing really throwing me through a loop. There’s a couple of other plot surprises, though. It’s one of my favorite one of Brandon Mull’s books. I will say, though, that I didn’t like the sequel all that much. It was alright, of course, but it had this whole magical arcade with pins built into it, and it almost felt like it was set in a differently world, just with the same characters. I tend to think of The Candy Shop War as just a stand alone novel. These kids have a really cute friendship, and I especially like Summer. She’s kinda awesome. This book also has plenty of action scenes, but it’s really a very safe book. No goryness, no cussing, no kissing, just good ol’ friendship and magical candy. John Dart’s a pretty crazy character. I’ve gotta say, it’s been a while since I’ve read this book. Any middle grade book, really, since my English teacher’s been keeping me so busy with vaguely boring reading material. What I mean to say, is that I don’t quite remember if I liked him or not, but I’m pretty sure I did. I really did like the creativity of the different types of candy. Müll didn’t just go Classic flying, super strength, talking to animals. I mean, he had those, but he also came up with some really awesome ideas for the candy that are powers I would love to try out. Also, this book has an excellent ending. I’d like to end by saying that the reason that I am joining the MMGM group on the second week of the year, instead of on the first, is because I did one last week, but accidentally mistyped Shannon Messengwr’s email. Oops. Anyways, if you’d like to read that one, on Lost in Lexicon, by Pendred Noyce, just scroll down to my previous post and enjoy! Have a great week! When thirteen-year-old cousins Ivan and Daphne go on a treasure hunt in the rain one summer day, they never expect to stumble into a whole new world where words and numbers run wild. After the cousins outwit a plague of punctuation, grateful villagers beg them to find Lexicon’s missing children, who have been enticed away by dancing lights in the sky. Trekking between villages in search of clues, the cousins encounter a talking thesaurus, a fog of forgetting, the Mistress of Metaphor, a panel of poets, feuding parts of speech, and the illogical mathematicians of Irrationality. When a careless Mathemystical reflects them across the border into the ominous Land of Night, their peril deepens. Kidnapped, imprisoned, and mesmerized—with time running out—will Ivan and Daphne find a way to solve the mystery of the lights in the sky and restore the lost children of Lexicon to their homes? That out of the way, onto the book! This book is, truly, an adventure in words and numbers as Ivan and Daphne battle their way through Lexicon. There are also llamas, bees, and fog. Daphne’s specialty is with words, particularly poetry. She has memorized dozens of poems, and is fascinated with different word rhythms. Ivan, on the other hand, loves math. He is an expert at deciphering patterns, making sense of them, and putting those patterns into good use in creative and fun ways. One thing I will say about this book is that although I do believe it is a middle grade book, I have reread it multiple times as I have gotten older, and I want to reread it again at some point in the near future, and the older I get, the more I appreciate the book. Or, not exactly the older I get, but the smarter I get, and the two seem to generally correlate. I must warn you, the math in this book is complicated, and the poetic terms and literary devices mentioned are not commonly known. However, you can enjoy this book simply as an adventure book. It’s funny, it’s exciting, it’s creative. You don’t have to understand it entirely to read it; in fact, you should probably go into it expecting not to understand all of it. Just skim those parts, and hopefully you’ll still love it as much as I did. If you do this, though, please, please reread it when you’re older. Even if you’re not the rereading kind of person, every time I open it up I love it more than the time before. So read it if you want a humorous adventure book, if that’s what you want out of it, or, if you want a stretch of the mind in a new and clever way, pick it up, and I don’t think you’ll be disappointed. Enjoy the first week of 2017! Until next time! NOTE: the reason this wasn’t on her website is because I accidentally sent it to SWMessenger@hotmal.com instead of SWMessenger@hotmail.com. *sigh* Next week! The post you’ve been waiting for. 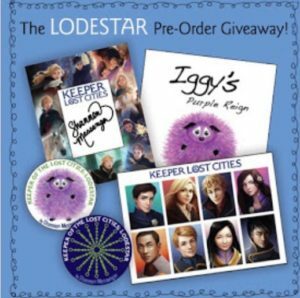 THE LODESTAR PRE-ORDER GIVEAWAY IS HERE!!!! Now that we’re three weeks away from the launch of LODESTAR (AHHHH–WHERE DOES TIME GO??? ), it’s time to make sure you know how to get your free swaggish goodies! And yes, EVERYONE who pre-orders the book and fills out the form before the cutoff date will get that!!!!! You don’t have to do anything special to enter for the extra goodies. I’ll choose the winners randomly from all the people who fill out the form for their swag. So that’s the only requirement: you must fill out the form at the end of this post. Which of course means you also must pre-order a copy of LODESTAR. And because I like to keep things simple, I don’t require proof of purchase for the giveaway. If you say you pre-ordered LODESTAR, I trust you. But remember, liars have to lick lockers that taste like Iggy breath–meanwhile honest people get to eat big bowls of Starflower stew! 🙂 I also won’t be announcing the winners of the additional goodies. 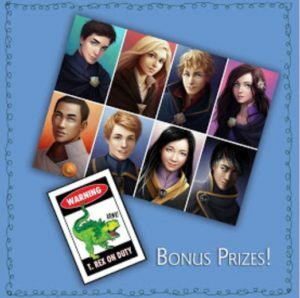 If you win the extra swag, you’ll find out when your prize arrives in the mail. This giveaway is open internationally. It also doesn’t matter if you pre-order an eBook or a hardcover. As long as it’s LODESTAR, it counts. And you can buy your copy anywhere books are sold. Of course I recommend shopping local from your favorite indie and supporting a local business. But it’s up to you where you want to shop. 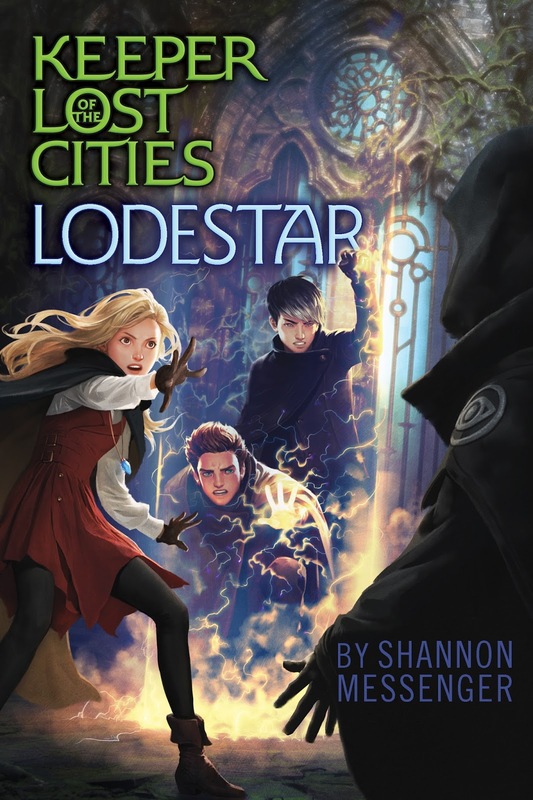 I also know lots of you pre-ordered your copies of LODESTAR months and months ago (which is so incredibly awesome, btw.) And if that’s the case, you can definitely still fill out this form and get your free swag pack. But if you haven’t ordered LODESTAR already, you must pre-order your copy before 11:59 pm (pacific time) on 10/31/16 AND fill out the form before then. After that I’ll close the form and there will be no more ways to enter. And there’s no limit on how many swag packs you can get–as long as you buy the corresponding number of books. So if you pre-order five books, you can get five swag packs. Just make sure you tell me how many copies you pre-ordered so that I know how many swag packs to send you. Also: since I’ll be on tour when this contest ends, there *will* be a delay on when your swag gets mailed to you. It won’t come with your book, since your book will be coming from wherever you ordered it from, and then I will be mailing the swag separately as soon as I’m home from tour. I PROMISE I’ll have them all in the mail before November 30th. (most likely much sooner). And I always post on my social media when they go in the mail, so you’ll know when to keep an eye out for it. Sorry for the small wait, I can’t mail stuff while I’m traveling. One final option to keep in mind, since this is the point where many of you start panicking and emailing me saying BUT WHAT IF I’M NOT ONE OF THE LUCKY 25 WINNERS?????? I REALLY REALLY REALLY WANT THE SPECIAL POSTCARD AND BUTTON!!!!!! Once again, I’ve teamed up with the incredible people at Changing Hands Bookstore to give you a way that you’re guaranteed to get the extra pin and postcard. If you order your copy of LODESTAR through Changing Hands before my event there at 7pm on 11/16/16 (yes, you even get a couple of extra weeks to take advantage of this awesome offer), they’ll send you all of the swag I’ve mentioned in this post (except the signed book plate, since your book will actually come hand signed by me) as well as the extra postcard and the Verdi button. Changing Hands will ship anywhere–even internationally (there IS a shipping fee. You can call them for an estimate: 480.730.0205). – Changing Hands won’t ship your book until after the 11/16 (since they’ll be holding onto them until I can sign them). But it will be worth the wait because you’ll get a hand signed book and the extra goodies. – Another advantage to this: this is the only way–aside from coming to one of my signings–to have your book personalized to you. I used to personalize all the bookplates, but that’s gotten WAY too time consuming. So if you want a personalized, signed book–AND all the fun goodies I’m giving away–Changing Hands is the only way to go. But again, you HAVE to buy your book from them. Um……….. I *think* that covers everything–but if I missed something, feel free to ask in the comments. (note: I will only answer questions posted in the comments on my website. If you’re reading this on Goodreads or any of the other places it feeds out to, make sure you go to shannonmessenger.com to ask your questions. And I’m also only going to answer questions that haven’t already been covered by this post, so please make sure you’ve read this post carefully before you ask). And …. I guess that’s it. Though I do want to once again thank all of you for incredible support. This series keeps growing and growing and it’s all because of you. I can’t wait for you to read LODESTAR. I’m so incredibly proud of it. Only three weeks to go–AHHHHHH!!!! !